During the 1970's and early 80's, Las Vegas suffered through a number of severe floods. With an annual precipitation of 4.17 inches spread over an average of 21 days, a number of these floods, such as the July 3, 1975 "Caesars Palace" flood, were a result of rainfall amounts that produced a few inches within a matter of hours. Being ill-equipped with patch-work and piecemeal band-aids of the time, the city was susceptible to flash-floods that resulted in millions of dollars in losses and damages as well as fatalities. In 1985, legislation was passed by the state of Nevada allowing for the creation of local flood control districts. The following year, the Clark County Regional Flood Control District was created to put forth a coordinated effort to develop and implement a comprehensive flood control plan for the valley. Today, the effort is a little over 75% complete leaving some areas of the valley vulnerable. During the last 30+ years of unprecedented growth, perhaps the most vulnerable are those who have fallen on hard times and seek solace by living in the flood channel tunnels under the Las Vegas Strip. Rumored to have numbered close to 1,000 shelter-seekers at its peak, the tunnels, meant to improve safety for those in the flash-flood zones above ground, have unfortunately led to a number of fatalities for those choosing to live there. The first short video finds Matthew O'Brien, author of Beneath The Neon, chronicling the tunnels and their residents and what it's like to live in the tunnels. You can visit O'Brien's "Shine a Light" program that seeks to help with services and support for those in need here. The second video presents Tapped News correspondant Matthew Graham's quest to document the living conditions in the tunnels. Matthew would be met with wary residents who watch out for and protect one another. Matthew later meets up with Matthew O'Brien who helped him gain access to make his short film. One of the more interesting encounters is with "John," a middle-aged man who willingly gave up a good life having owned several banks and companies, leaving it all behind for his wife to live under the tunnels. 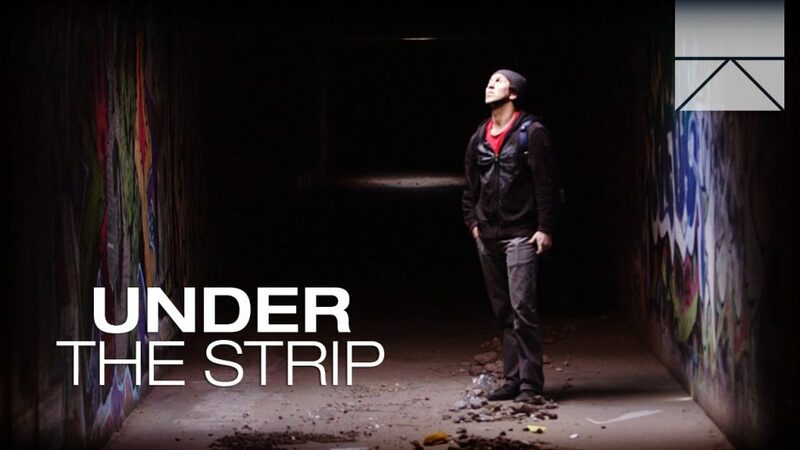 The third video, a vlog by Living In Las Vegas, takes you on an expedition below the surface, revealing graffiti artwork and where some of the tunnels actually come out to near the strip. The fourth and fifth videos are parts 1 & 2 of a production by Al Jazeera English "Witness" documenting more of the living conditions for hundreds of people and how difficult it is for some of them to leave. The final video, a presentation from The Guardian's "Outside In America," shows some of the elaborate set-ups people have rigged together to survive day-to-day in the tunnels. Screenshot from Seeker Stories, A Discovery Channel Digital Network Production. Total Spent On Flood Control: As of 2014, $1.7 billion had been spent since the creation of the Regional Flood Control District in 1985. Number of Flood Related Deaths: Since 1960, there have been 32 flood-related deaths in Clark County. Flood Spells Tragedy For Tunnel Dwellers - NPR Audio Interview (this features an interview with Jazz, featured in one of the videos, who lived off and on in the tunnels for 20 years and lost his girlfriend, Sharon, to a flash flood in 2016. It's gut-wrenching to listen to.